I have a problem when there is a fresh pan of brownies in the kitchen. And I can’t sleep. And I’m the only one home. And I’m not tied down to the bed. 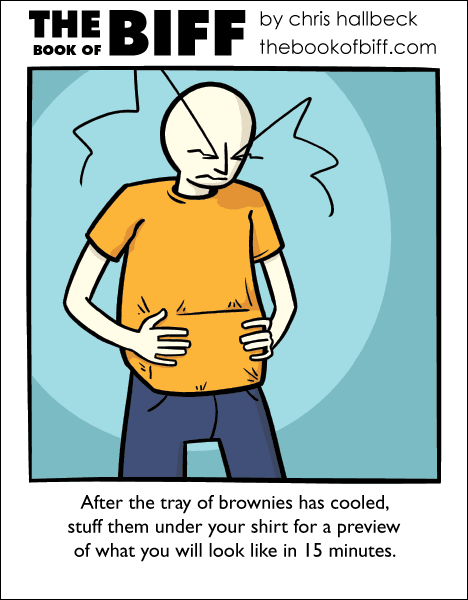 Or just stuff an identical tray under your shirt instead for that preview so your brownies are still edible. Ah, the irresistable siren call of fresh brownies! Hi…Did you know your site’s hosed? The homepage shows the comic from a week or so ago. You need to clear your browser’s cache and/or hit refresh a few times.